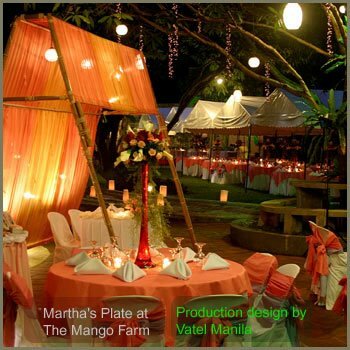 Vatel Manila's signature A-tent lords it over a recent event at The Mango Farm. I can truly say that 2005 was a breakthrough year for me. Aside from the fact that we got over several medical issues at home (one of which appears to be rearing its ugly head once more), it was also a good year to start a new business. 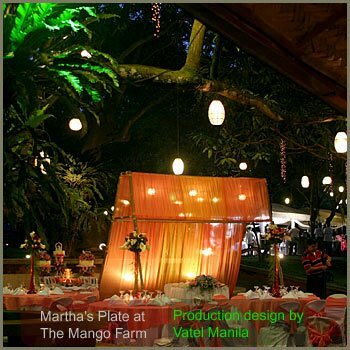 Despite having so much to do on weekdays, the events production company, VATEL Manila was finally started last summer. We've had 2 projects since we opened and only last week, 2006 opened with yet another project in Cavite - the first outside Vatel's homebase of Antipolo - a 50th wedding anniversary. However, that latest engagement found me recuperating in bed for the last 3 days. Don't you just hate it when you have fatigue written all over your face? Even if I am now able to return to my duties, I still feel that tiredness deep inside, as if it has invaded every lacuna of my bones. My mitochondrias must be hard pressed lately to make up for the lack of rest and sleep. At least I got compensated for my efforts, even if I had to do it for a distant Aunt. So what am I looking forward to this year? More projects, of course. I am in constant search for that elusive "distinct style". My drawing board is busy at the moment with ideas being translated into set-ups. I want to take this chance to thank TMF owner Mike Santos for the chance to start Vatel Manila, and to work with him and the farm. It has been very fulfilling indeed. Another big thanks go to husband-and-wife tandem KJ and AM of Martha's Plate, TMF's in-house caterer. Here's to more projects in 2006! For now, I want to learn how to make an effective and efficient system of ordering flowers and not have to run out of them again on the very night I needed them. Dangwa can be a very mind-boggling place. It follows the rule of "When you need 'em, you can't find 'em." I hate having to look desperate at 2AM. Some can call it small-time inefficiencies. I call it birth pains.